Apparel Search does not often post fashion articles regarding watches. However, a watch is clearly and important fashion accessory. Today's shopping article focuses on the limited edition chronoscope watches as pictured above. You may have interest in the Limited Edition ChronoScope Watch (Barneys Style # 500215040 )This watch is a 47mm stainless steel case with black dial, white luminous dial indices and hands and sapphire crystal on leather strap. Automatic movement with hours, minutes, subsidiary seconds, day, date and chronograph functions. Water resistant to 5 ATM. 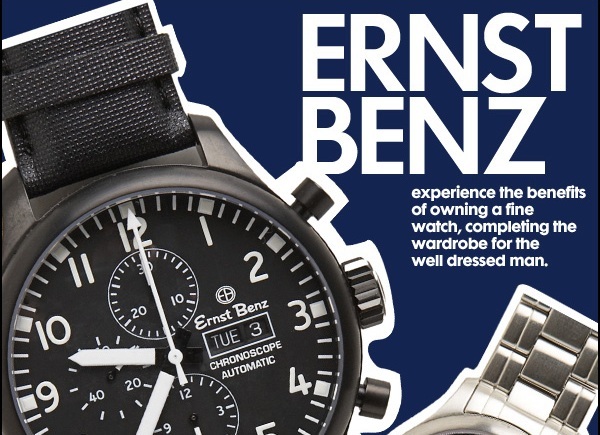 Swiss engineer and inventor Ernst Benz first became well known for developing delicate instrumentation and manufacturing timepiece and industrial jewels...Learn more about Ernst Benz Watches.